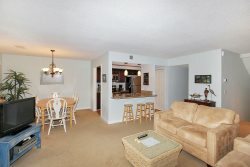 2 bedroom, 1 bath 1st floor Breakers Villa located on Forest Beach in Hilton Head Island! The only thing that will be on your mind once you enter this one of a kind 1st floor Breakers unit is rolling waves and sunshine! Upon entering you will be greeted with the master bedroom on the left. Equipped with a queen bed, flat screen TV and a double door entry. Past the bedroom is the washer and dryer as well as a recently updated full bath. A galley style kitchen filled with all of your cooking necessities leads into the living room area with flat screen TV and sofa with a queen sized pull-out bed for additional sleeping. Sliding glass doors open to the balcony overlooking the pool and beautiful Coligny Beach. Off the living room is a small office area with a queen size bed and a flat screen TV for playing videos games and watching DVDs only. The Breakers location is a favorite for hundreds of Hilton Head visitors. The Forest Beach area is known as Hilton Head's "downtown" offering wide variety bars, restaurants, gift shops and grocery stores, all of which are a short walk from The Breakers. Coligny Plaza, The Beach Market and the world famous Java Joe's are directly adjacent to the Breakers. All of this is situated within the natural beauty that is Hilton Head and directly on one of the finest beaches on the east coast. The Breakers complex is not equipped with elevators. Parking in the complex is limited to 1 vehicle pass per villa. EXTREMELY HAPPY WITH THE PROPERTY. PICTURES REPRESENTED EXACTLY WHAT WE EXPERIENCED AND MORE. Property overall was awesome..pool area and steps of the Breakers could use a good cleaning but overall it was exactly what we were looking for! Very helpful and a quick response when I called Sunset Rentals to ask about properties. Several possibilities were in my email box within minutes. The person I spoke with was knowledgeable and gave me important info about one we were looking at (construction in front of the rental and beach front closed). The rental was in great condition (small, but there were just two of us, so it worked great), and the cleaning crew had left the place in spotless condition - probably the cleanest rental we had ever had. Everything was as stated on the web site. Thank you for making our vacation easy and enjoyable. Also really appreciated not having to go anywhere to pick up a key! Easy check-in and check-out. Loved the location. It would have been nice to have extra trash bags but overall our stay was wonderful. Loved having a keypad to get in and out of our condo.